We would like to call your attention to an innovative scientific format for aspiring researchers – the Falling Walls Lab. The Lab is a platform for excellent academics, entrepreneurs and professionals from all disciplines who get the opportunity to present their research work, business model, innovative project or idea with peers and a distinguished jury from academia and business. Each participant has 3-minute time on stage. 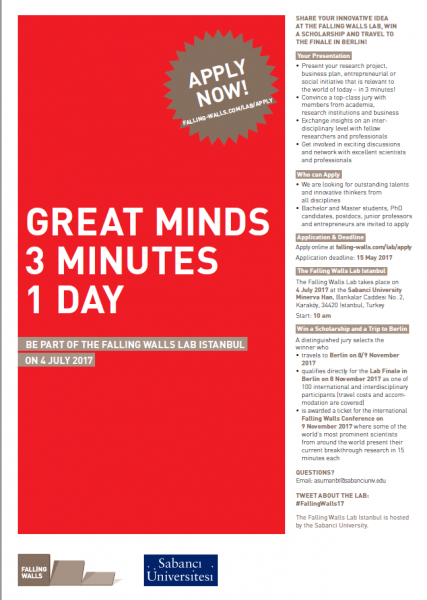 The Falling Walls Lab Istanbul is hosted by Sabanci University and takes place on 4 July 2017 at Sabanci University, Minerva Han, Bankalar Cad. No: 2, Karaköy, İstanbul. Applications can be made through the website www.falling-walls.com/lab. The Application Deadline closes by 05 June 2017.